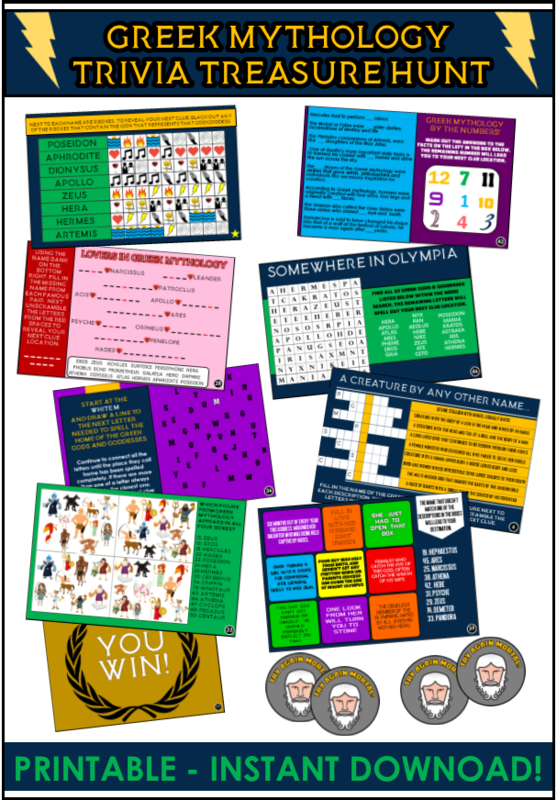 Awesome Greek Mythology Party Games for kids and tweens! Many kids find mythology to be a fascinating subject, and rightfully so. The stories concocted by the ancient people of Greece are especially intriguing, and are often the best tales to capture the attention of the younger audiences. After all, who doesn't enjoy hearing about the adventures of the all-powerful Zeus, or the many monsters that are so often found in these ancient stories? 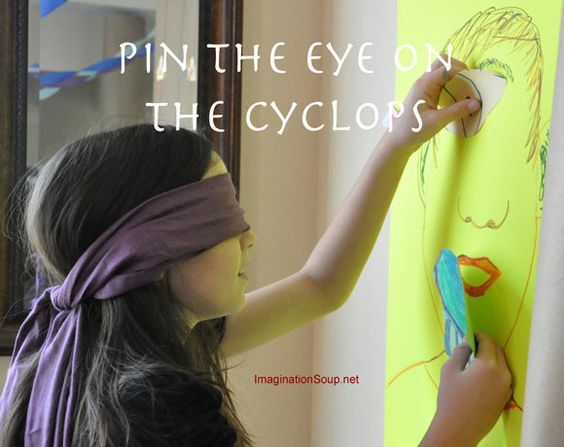 If you have a Greek mythology enthusiast on your hands, we have just the party plan for them. 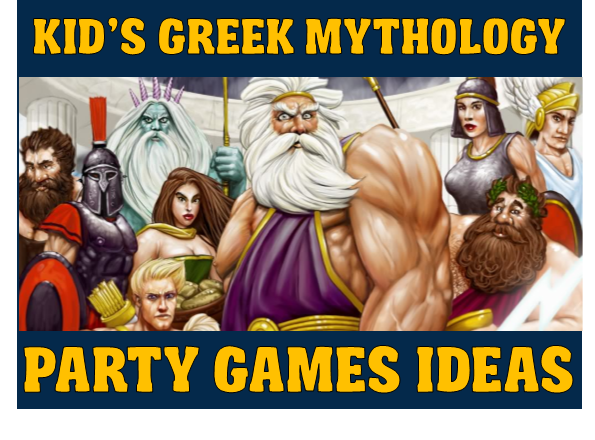 These mythology-themed party games are sure to get them out of their seats and having a bunch of fun in no time at all! Imagine turning around, only to see a terrible monster with snakes for hair staring you in the eye. The next thing you know, you feel your joints locking up and find yourself turned to stone, unable to move. This is how you would feel if you happened to meet Medusa while walking down the street, and it's how you'll feel while playing this game if you aren't careful. To play, choose one guest to be Medusa. This player will have the ability to turn people to stone by tagging them. However, all other players--or at least those who have not yet been turned to stone--can break the stone spell put on their friends with the power of a simple tap. 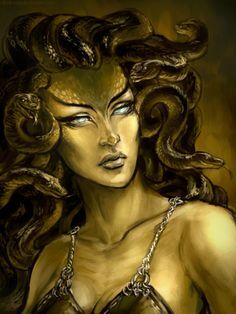 So while Medusa is trying to turn all players to stone, she must also keep a close eye on those who have not yet been tagged in order to keep them from undoing all of her hard work. Once Medusa has managed to turn all runners to stone, choose another Medusa and start another round. 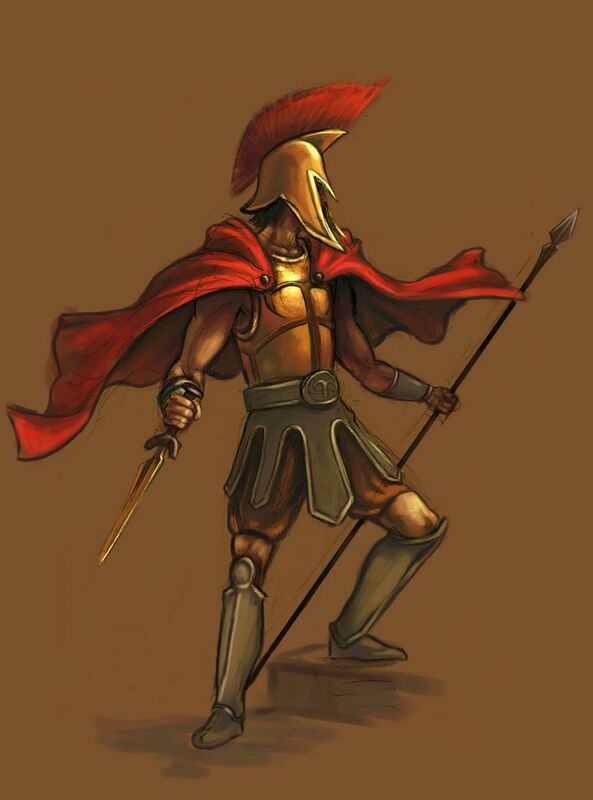 Ah, Achilles! How incredible it would have been to see you in action. Too bad that darn heel didn't measure up to the rest of you in terms of strength. If it had, you would not have been knocked down at the top of your game, and might even still be around for us to fawn over today. In this game you will need an inflated balloon with a piece of streamer tied to it's end and the other end tied around the players ankle. You will need one for each player. We use streamer instead of string because streamer breaks easily, this mean if a players streamer or balloon gets stepped on it will break not trip the player. The idea is that on the start of go all players run around trying to bust the other players Achilles' heel (balloon) while not having theirs popped. If a players balloon is broken from their ankle they can still stay in the game as long as their balloon is not popped. They cannot touch their balloon with their hands, but they can kick it to keep it away from other players. The last person to have an intact balloon wins! 8 intense challenges testing your knowledge of the Gods, Goddesses, and Myths we have come to know so well. Each challenge provides the clue to where the next clue challenge is hidden - all leading to hidden treasure! 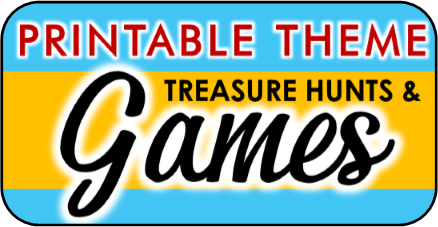 This treasure can be whatever you (the host) want and best of all the host is also gets to decide where the challenges are hidden so this game can be played anywhere - parks, homes, classrooms, etc. Check out complete details and clue samples now. 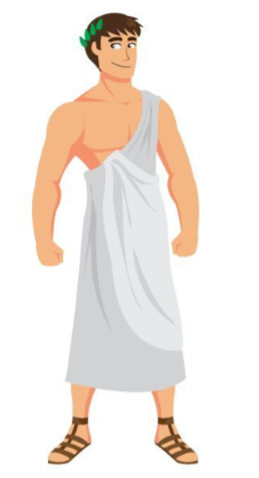 The people of ancient Greece, and even their gods, all wore togas. Therefore, it stands to reason that the guests at your Greek mythology party should do the same. This is a ridiculous game that is sure to have everyone cracking up before it's over. Before the party, buy a huge package of toilet paper. It doesn't have to be high-quality since it's just going to be used for a game. You will also need a stopwatch (the one on your smartphone will work just fine). To play, split the guests into teams of two and have each team decide which player will be the the model and which one will be the designer. Give each team two rolls of toilet paper, and instruct them to create a toga that will stay on the model during a fashion show. The catch? They only have two minutes to finish. The team to create the most fashionable toga that also stays on their model and intact during the post-game fashion show is the winner. The Greeks had a festival at Olympia each year to honor the most important god, Zeus. This festival was an athletic event, with contenders coming from every region of the country to compete over five days. These games were called the Olympics, so what better idea than to have a small, backyard, Olympic contest. Dividing the guests into groups, or teams, is the first step. Each team will take part in a running race, a three-legged race, a backward race, and a jump rope race. The team with the most first-place athletes is the winning team and will have olive branch crowns put on their heads. 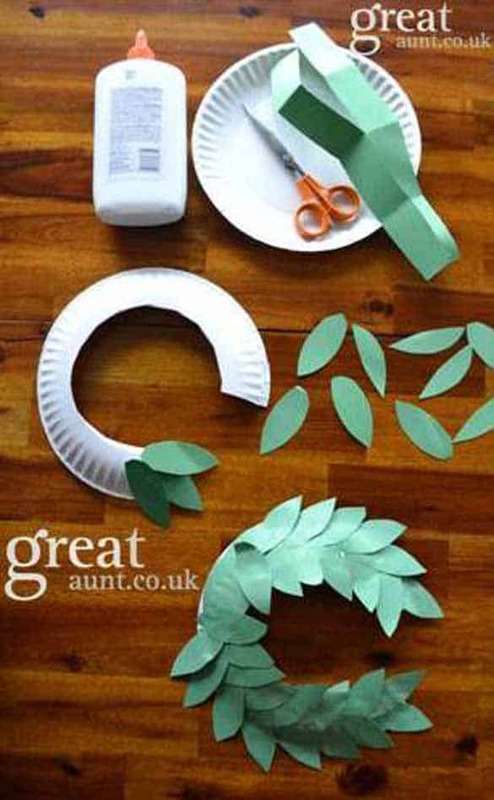 Olive leaf wreaths can easily be made using green construction paper, scissors, and tape. First, cut a strip of construction paper about 2" wide and 20" long. Two strips will have to be joined by tape to reach the 20" mark. Next, cut small leaves, 10 or 12 should do, and tape them to the long strip. Voila'! Apollo, the Greek god of music, among other things, was honored annually by a festival at Delphi which was chiefly centered on music. This ancient festival relates closely to having a modern-day a karaoke contest. If there is a karaoke available, that makes things easy, but if not, using a cardboard tube or a hairbrush as a microphone will do just as well. Pick music for a playlist filled with all the favorite songs of the honoree's age group, then allow small groups or individuals to participate. This venture could be an actual contest or just a fun activity that will probably be the hit of the party. 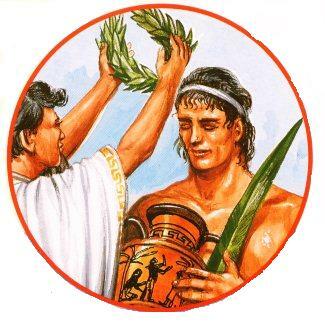 Togas and olive leaf crowns may be worn, or not. 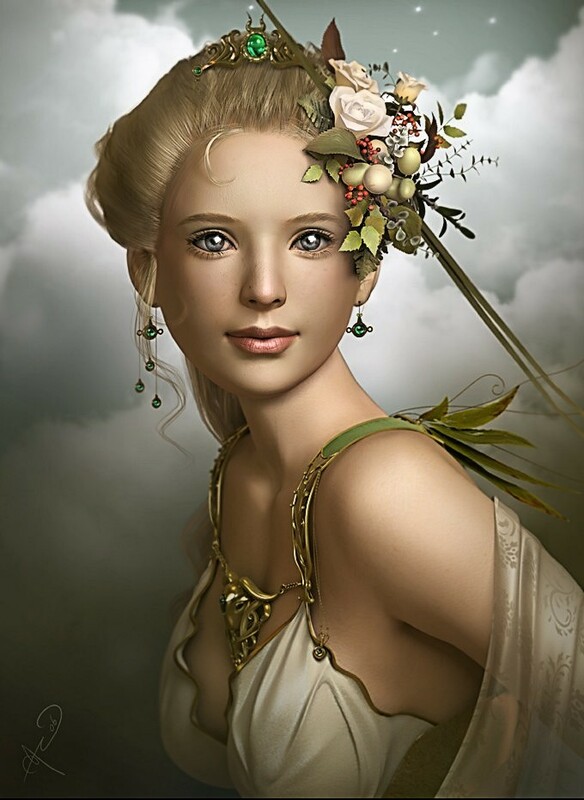 Demeter was the goddess of the earth and agriculture. In her honor, the children could have a try at making terrariums. Recycled jars or mason jars can be collected before the party. Add soil, charcoal to absorb any decaying material that crops up, a few stones for drainage, and a little moss. Spray some water on the plants in the jar using a spray bottle and seal the container with a lid. If there is condensation in the jar after the guests take them home, tell the kids to open the lids for a short time. Terrariums need watering infrequently. icarus don't get too close to the sun! Icarus, the son of Daedalus who was the inventor of the Labyrinth, tried to escape from being imprisoned in Crete by King Minos. 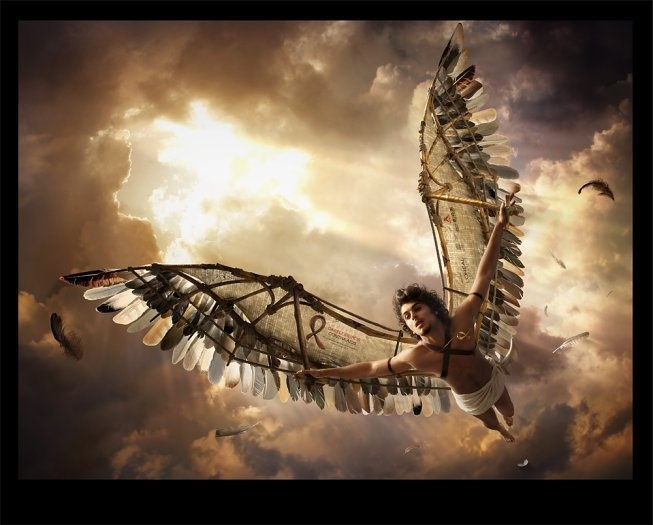 Daedalus gathered bird feathers and constructed wings using wax to hold the feathers together. He made the wings so he and Icarus could fly away, but warned his son not to fly too close to the sun or the wax might melt. But Icarus flew too high and fell from the sky, leaving his grieving father to continue on all alone. In this game the "sun" is represented by a yellow beach ball with plastic gold coins tacked all around it. Players must "fly" as close to the sun as many times as they can and take a coin WITHOUT being caught too close. To play place the sun in the middle of a 10 foot ring - this can be marked off with tape, rope, etc. Another ring should be marked off about 4 feet away from the inner one. To play the game all players stand outside the outer circle and someone starts the music. While the music is playing players are allowed to get as close to the sun as they want and steal one coin at a time, they must leave the inner circle and re-enter to steal another. But when the music stops everyone must freeze! Whoever is caught in the inner circle is melted by the sun and is out of the game. Whoever is caught in the outer circle loses one of their coins if they have any. Players outside both circles are safe until the next round. Keep playing until only one player survives or one players has stolen 10 coins. Give the winner a special prize and let the rest of the players trade their coins in for pieces of candy. 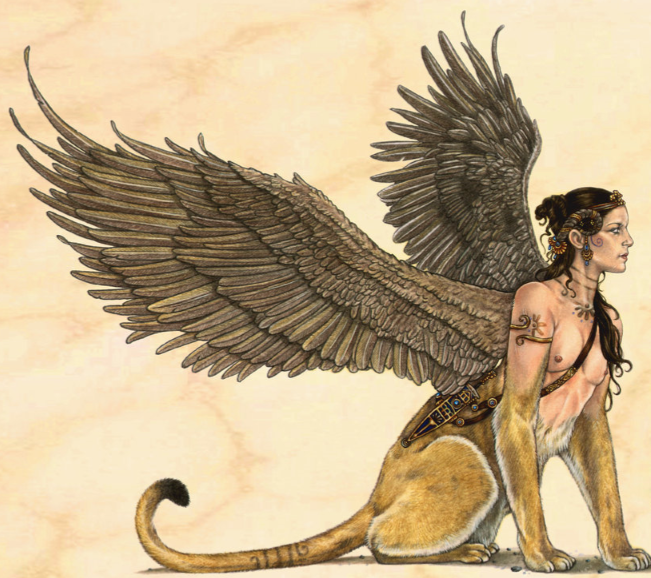 King Minos, who was so mean to Daedalus and Icarus, had a very unusual pet. His favorite friend was his Minotaur. It was half-man and half-bull, and Minos kept him in the labyrinth built by Daedalus. This game, called Escaping the Minotaur, is super easy and especially fun. One or two adults stand in the middle of the yard. When one of the grownups yells, MINOTAUR, all the children have to run from the line they are standing behind on one side of the yard to the line on the other side of the yard, without being touched by the Minotaur (the adults). Lines can be made with spray paint applied directly to the ground. 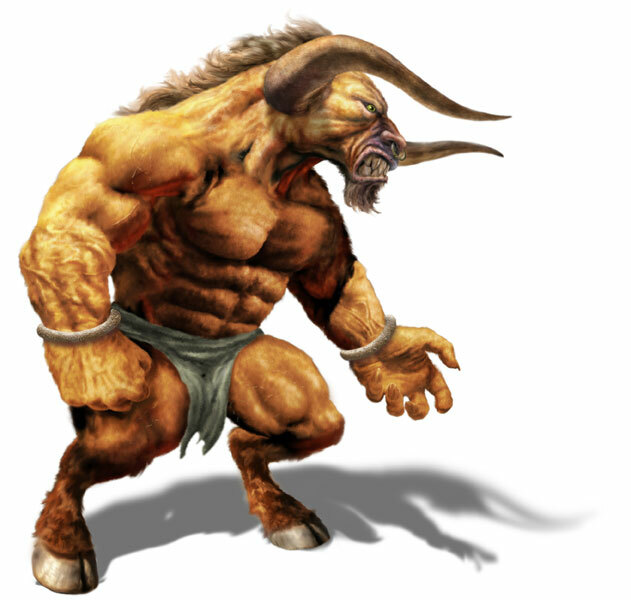 The last person left who has not been captured by the Minotaur, is the winner. The object of this game is for each player to get across the path by solving a riddle. You will need to have a riddle for each player and create a path using paper plates - each paper plates should have a letter of the alphabet written on it. Players line up at the beginning of the path and a riddle is read. If you want to add some spectacular you could record the riddles before hand with an ominous warning from the Sphinx. Once a child has her their riddle they must answer the riddle by stepping on the plates that spell out the correct answer. Make sure you set up the plates where the answer will lead each player from one end of the path to the other. If they make it across they win a prize. 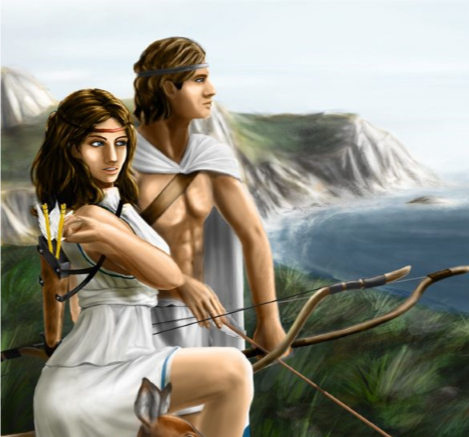 Before Artemis was tricked by her jealous brother into killing Orion they were great friends and hunting buddies. Their weapon of choice: the bow and arrow. In this game you will need a bow and arrow (toy one will suffice) and some hula hoops. Hang the hula hoops at different distances and heights from the trees and assign a point value to each. Let each player shoot five arrows and try to make it through whichever hoops they choose. The player that scores the most points wins! More awesome ideas for games including this one involving Hera's watchmen Argus. 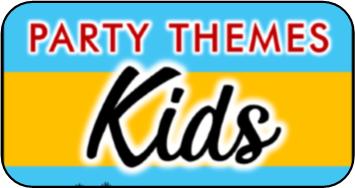 Percy Jackson party ideas and games! Olympic party ideas including this tutorial on how to make a victory wreath!